I am super excited that my grandson nursery is finally done. My daughter was looking for a non- traditional nursery that had all the comforts needed for the baby.One of the many features of the nursery was the nursery changing table. I transformed an old dresser into a stylish changing table. Some of the features and the functionality of the baby’s changing table. We added a super thick baby pad for changing the baby. The dresser has lots of drawers for storage of baby items such as diapers and clothes. The top of the dresser is wide enough for the changing pad providing lots of room. The traditional changing table height must be comfortable enough for the mother to change the baby. This dresser was perfect for this conversion. Here is what you need to transform dresser into a stylish changing table. Proper height of top of dresser for changing. The top of this dresser was yellowing and the paint was flaking off so it needed to be stripped. Once stripped and sanded it was ready for priming. I painted the entire dresser with the primer. Then for final coat I used an off white semi gloss paint by Sherwin Williams that I had left over from another project. My daughter did such a great job in picking out the color and the non traditional nursery decor pieces. Her son Theo will be able to grown into this without her having to re-paint or change to much of the room. 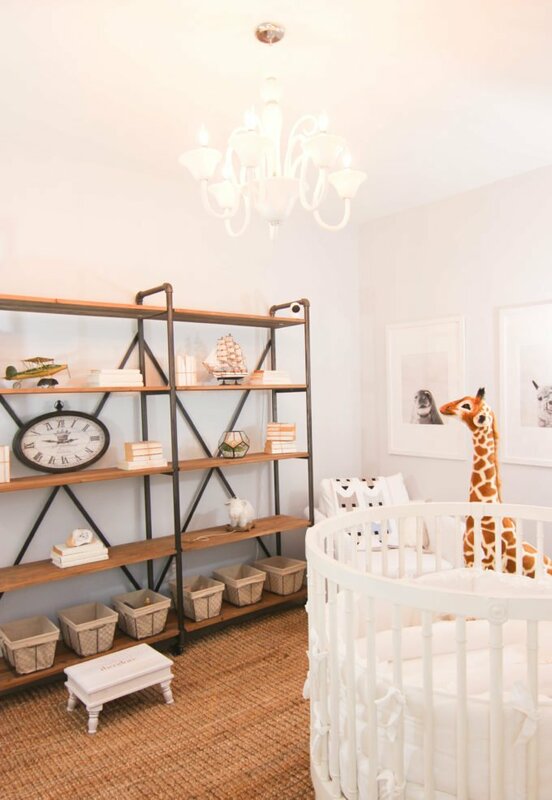 I love the reclaimed shelving which displays simple items that are perfect for a baby boy. Her use of baskets is a great idea to keep things organzed. 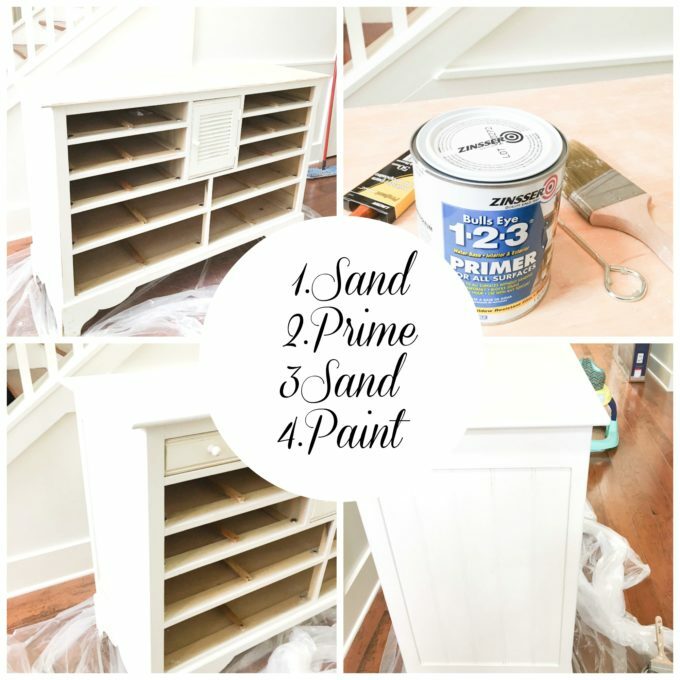 Here is another dresser diy, this one was the first time I painted a pieces of furniture. Glad you like it! I just wished there was more light there, it was hard to take Photographs, I need to take a course in that. I used a several lights and it still seemed washed out. Thanks for visiting, it was truly fun doing it for my grandson. Maria the whole room is so so pretty! And it can grow with the baby. Yes that was our goal and hopefully not many changes. What a lovely and calm space for your new grandson! 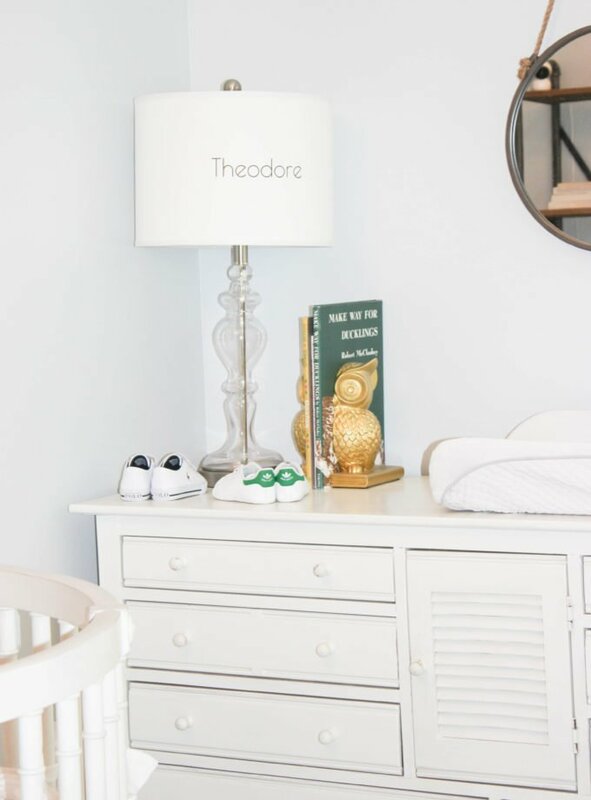 There is nothing like a grandbaby, and what a joy to be a part of styling this pretty nursery! Yes it was fun to decorate with my daughter! There is going to be another baby soon, so we are planning another nursery. Yes it the best way all done with love. The room is AMAZING! 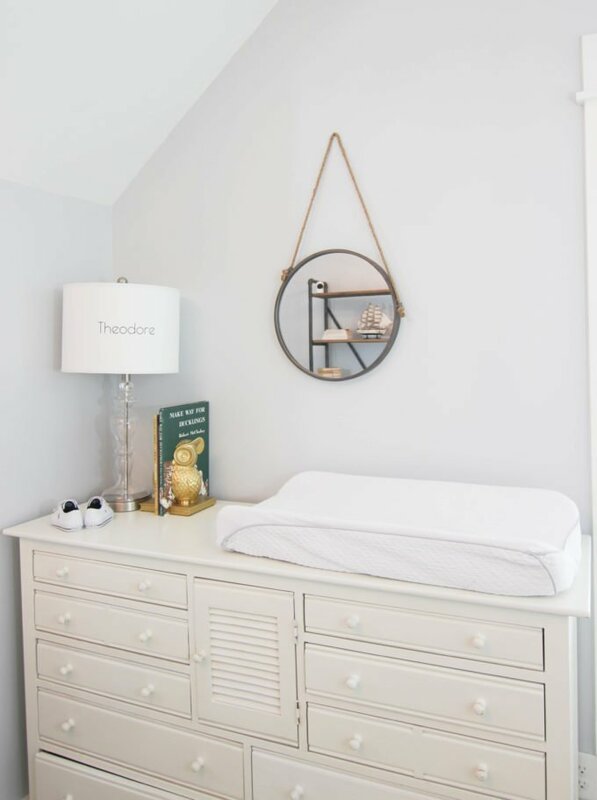 Love the shelving unit and that wonderful changing table! Thanks Pam for that sweet comment! It was fun decorating with my daughter. Ooooh! I love all the white!!! Great repurpose of the dresser for a changing table, Maria. We did the exact same thing 27 years ago when our daughter Amy was born. In fact, the dresser was literally a dumpster dive! Or, rather, right next to the big dumpsters in our apartment complex in La Jolla, California. 😉 My hubby and I saw it while taking out the trash, thought about it for all of three seconds, and hauled the dresser upstairs to our apartment. After scrubbing it inside and out, I placed the changing pad on top, decorated the walls with cute Peter Rabbit bunnies I’d found somewhere online and sent to England for them, and waited for our baby girl to be born. Your changing table sounds so cute, thanks for visiting me and pinning my post. 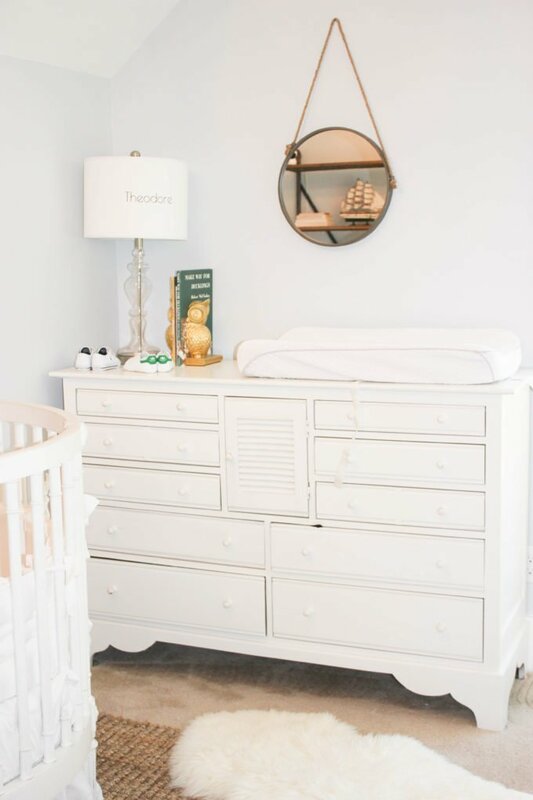 This is such a pretty room and I love your changing table! My granddaughter arrived last week and my daughter is still picking out room ideas. I’ll send this her way! Pinned!